Removes shedding hair like magic. Shed Ender features a proven design that removes dead, loose hair where other brushes fail. 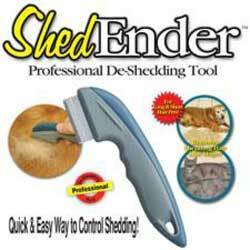 Shed Ender is a professional de-shedding tool that removes shedding hair trapped in your pet’s undercoat. Shed Ender keeps shedding hair off your pet and out of your house and off your furniture and clothes as it promotes a shiny coat and healthy skin. It’s safe and gentle for dogs and cats. Shed Ender works quickly & gently on all breeds of dogs and cats. You and your pets will love it!